Rethink Construction. Curved bath elements and columns are no problem with this innovative, smart product. Light and easy to work with, Schluter-KERDI-BOARD gives tile setters more control over their projects by providing them with the means to simply and easily create ideal substrates for tile. Schluter-KERDI-BOARD is a multifunctional tile substrate and building panel, which can also be used for creating bonded waterproofing assemblies with tile. The grooved version of the Schluter-KERDI-BOARD panel is designed for creating rounded and curved elements.coverings. This easy-to-use product will change the way you approach tile projects. Bring the Outdoors Inside. Especially in Bermuda and the Caribbean, embracing the outdoors, the sea breeze and the beauty of nature is always in style. 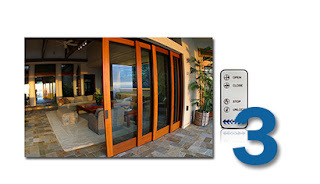 We work with Doors in Motion to automate doors and windows everywhere throughout the home. With just the touch of a button you can easily and seamlessly open your home to the outdoors.